Why would I need an F88002 Rail System? Do you have a Queen size bed and does your mattress set sit way too high? Would you like to lower the overall mattress height? Maybe they have cracked, split out, or broke? W. Silver Product’s F88002 Side Rails can be used to replace your existing queen size bed sides. The great thing is they are beefed up and loaded with extra middle support not found in the average frame. W Silver Products (WSP) rail system is a patented, slat-less hook rail bed frame that hooks into virtually any existing bed with a headboard and footboard. Their bed rails are built and shaped from 1 1/2 inch wide hardened carbon steel which provides support and strength required by nearly every mattress company. 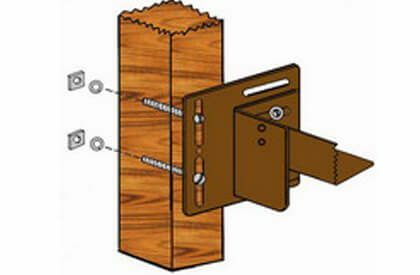 Unless you are receiving slots that are worn out or the not standard, the down hooks slide in for a snug and safe fit. The design of the L shaped side rails are made from hardened 1 1/2″ steel angle iron that gives uniform support along the entire length of the boxspring. In most cases this makes the need for wooden slats unnecessary. 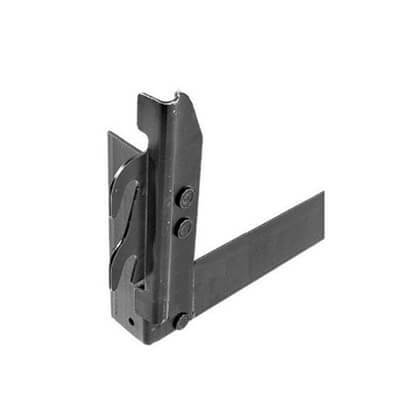 The F88002 drop rails have an additional feature not often found in standard rails, an extra cross arm for a total of two much-needed center supports that span the frame’s width. The hardened steel cross supports telescope to fit more bed widths while keeping the side rails from spreading apart like an old whiskey barrel. 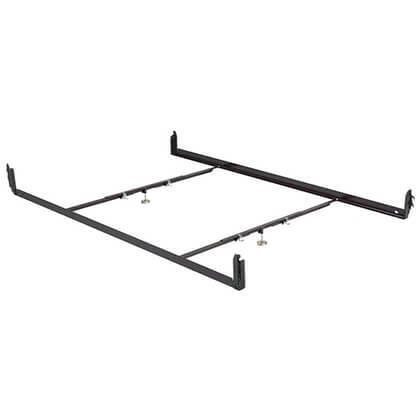 Queen beds require more than just two side rails. Your new cross-support arms also hold up the middle of the bed with two legs. The two legs have adjustable feet that are threaded and can be positioned 4 inches to 7 inches off the floor for the proper leveling of the boxspring, mattress support, and bed connection. The rails measure approximately 82″ long leaving just enough space to make the bed between the mattress and the headboard and foot board ends. If you do not want the 3 1/2 inch drop, check out the 62CS.